The Pot Stocks Are Still In Consolidation! Cannabis stocks have been riding a wild rollercoaster this year. Legalization in Canada and increasing public awareness in the US is pushing the companies’ valuations to the extreme levels. Nevertheless, it is the most speculative industry on the financial market this year and thus, the prices go up and down exchanging profit taking for consolidation. Many marijuana stocks have signaled the signs of recovery in recent days when they increased by even 10% from recent lows. This is definitely a good thing and if they really bottomed, they have done it in the justified territories. However, do not get too zealous about a recent bounce, we still need to confirm it. Don’t get me wrong – if you are a long-term investor, this is the best time to jump in to acquire more shares for a serious discount. However, if you are short-term trader, you may want to wait for confirmation, maybe re-test! 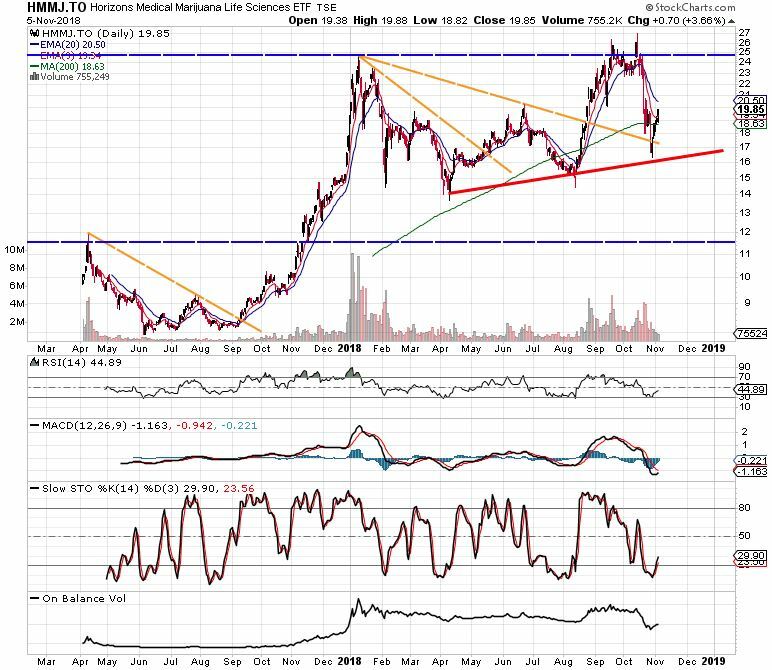 HMMJ.TO – Horizons Medical Marijuana Life Sciences ETF provides a very healthy picture about current cannabis situation. The price managed to break a long-term resistance in September and October but did not stay above for more than one day. See a top dashed blue line. This has encouraged the profit takers to take advantage of the market and weed stocks must have consolidated erasing almost half of their value. The price decrease stopped at around 17 which is an interesting level because it let us to determine a very important support level – red line. Why the correction may still be happening? The most recent price rise was not accompanied by increased volume at the particular days. This means that only a small number of investors believe this is bottom and the same number of them managed to drive this bounce. If this rise is really justified we should be seeing much more volume coming in the next days. True is that RSI hit the 30 level – this is a good sign showing that stock is oversold, however, it did not return to above 50 area. It needs to stay above 50 to justify for a change of trend. MACD line still did not cross the signal line and furthermore, it is still in negative territory. The good sign is that histogram is very close to a positive territory -0.221. On Balance Volume is still quite showing no divergence. Although there are signs of recovery, we are still waiting for a justified confirmation. The price is likely to test 16 level again before rising to heaven as it is expected from cannabis industry in long-term. Or it will provide all the confirmations and rise high this week.